Number 10 Downing Street is the home of the United Kingdom’s Prime Minister and the headquarters of Her Majesty’s Government. But many folks in Wilson, North Carolina would argue that 3007 Downing Street is far more important. For it’s at this address that His Majesty Bill Ellis has his castle. Bill Ellis’ Barbecue is a several acre complex that includes a buffet restaurant, a separate drive-thru/takeout building, and an 18,000 square foot convention center. But is all of this real estate an indication of the great food that Ellis’ serves or a Royal family-style way of distracting from significant shortcomings? A little bit of both, in my opinion. 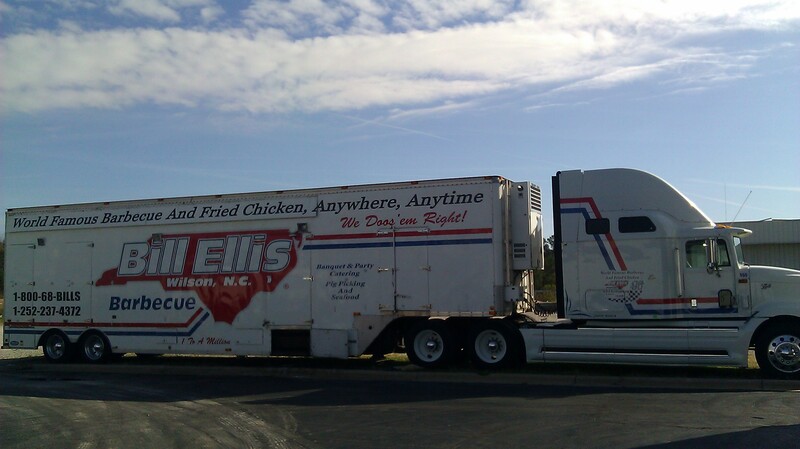 In addition to the several buildings at Ellis’ Barbecue (described above), there is a fleet of dozens of trucks that might make the British Army jealous: 18-wheelers, smaller tractor trailers, delivery trucks, and even dump trucks all with Ellis’ logo emblazoned on the side. Despite Ellis’ claim of “coast-to-coast catering” it is hard to imagine any occasion, other than an invasion of Redcoats, that would require more than a fraction of these vehicles be put into service. That said, owner Bill Ellis does have a large catering operation, a thriving restaurant business and even his own hog farm, plus that convention center. If anyone BBQ joint can come at all close to justifying a fleet of trucks this large, it’s Ellis’ Barbecue. Is it relevant to begin a restaurant review with a few paragraphs that have nothing to do with the food? Possibly not, but Ellis’ Barbecue is one of the very few joints in the state where the food can get lost in the surroundings. That is largely because the surroundings are so memorable, but also because the barbecue is quite the opposite. 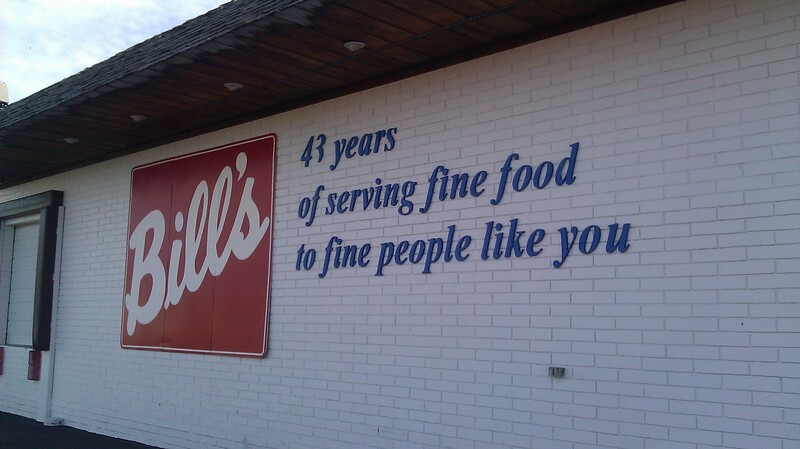 (This is in stark contrast to Wilson’s other famous BBQ joint, Parker’s.) 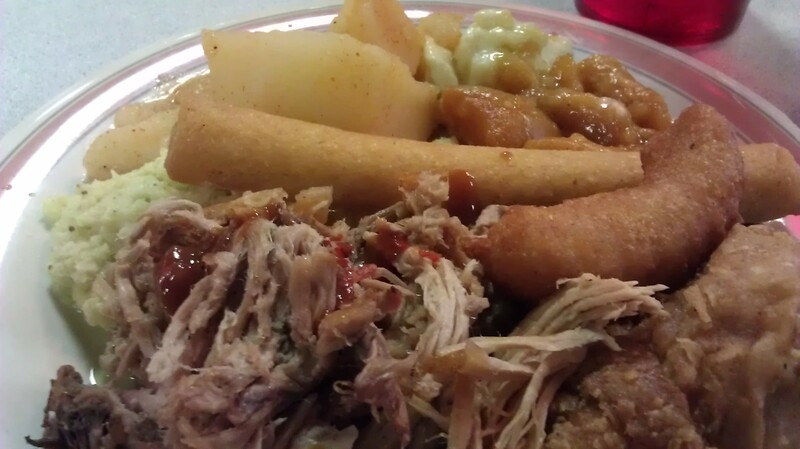 Ellis’ Barbecue offers a well-executed buffet dining experience with several side dishes that stand out as far above average, the pork itself is middle-of-the-road. You could do just fine for yourself by wading through the buffet line and gorging on candied yams, delicately spiced sweet yellow slaw, tender collards, odd-but-tasty Brunswick stew, classic boiled barbecue potatoes, fried chicken, meringue-topped banana pudding, hush puppies, corn sticks, and many other dishes. Most of these dishes are good, some are very good, and only a few (the from-the-can fruit cobblers come to mind) are subpar.